Georgia State won its first ever Sun Belt Conference championship with a 4-2 win over No. 2 seed Georgia Southern in Statesboro on Nov. 11. A hat trick from senior Hannes Burmeister and a late goal in the final minute from Frank Rosenwald gave the Panthers a 4-2 victory over the Eagles. This marked the first ever hat trick in a Sun Belt championship game. Burmeister scored the first two goals for the Panthers on penalty kicks in the 27th and 74th minutes. Georgia Southern got on the board in the second period when the Eagles’ Javier Carbonell scored off a mistake from Kyle Lancaster in the 66th minute. Lancaster tried to bring the ball back into the box to pick it up when Carbonell stole the ball and knocked it in for the easy goal. Lancaster made his first start of the season in the championship game due to the injury of the Panthers’ primary keeper Paul Tyson. The Eagles then took a 2-1 lead in the 72nd minute off a set piece from Aldair Cortes. The Panthers regained hope in the 74th minute when a foul gave Burmeister his second penalty kick of the day which he converted to tie the game up at 2-2. The biggest goal of the game came from a beautifully placed lob from Max Hemmings to Burmeister, who beat the goalie to punch in his third goal of the day and give Georgia State the advantage. A final defensive stand from the Panthers with 45 seconds to go lead to the Rosenwald having a wide open goal on an empty net in the final moments. Burmeister went scoreless during the entire year, but his three goals in the championship moved him up to ninth place in Georgia State history for career goals (26). After going to the conference championship and losing for four consecutive seasons, finally coming away with a win was very emotional for the team’s eight seniors. “To be able to get over that mountain is huge, and I’m pleased for these guys. They deserved it, they put a lot into it, and it feels good,” Surrency said. The first-seeded Panthers had a quarterfinals bye into the semi-finals where they beat defending conference champion Coastal Carolina 2-1. This was a huge win for Georgia State, who have lost to Coastal Carolina in last two conference championships. The Chanticleers dominate the series, winning 10 of the last 13 competitions going into Friday’s match. Friday’s semi-finals matchup started off with a goal headed in by Hemmings off a cross from George Proctor in the 13th minute. Hemmings scored two goals in the Panthers’ 4-3 victory over Coastal Carolina during Senior Night. Then the Chanticleers were awarded a penalty kick in the 37th minute and converted it to tie up the score 1-1. 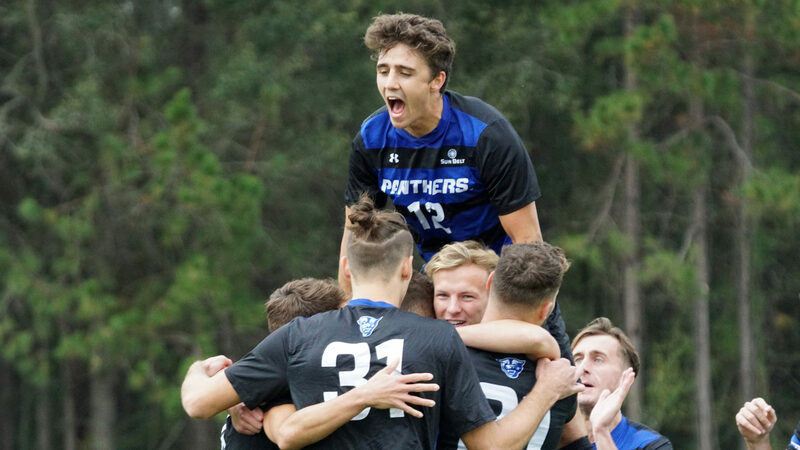 Georgia State was finally able to break the tie in the 77th minute after a deflected shot from Tristan Jumeau was booted in by Frank Rosenwald for the 2-1 lead. The 2018 season was a historic one for the Panthers. They won their first ever regular season title, went on a six-game win streak for the first time in over 30 years and secured the first Sun Belt title for the program. The team also received nine postseason honors, the most for any team in the conference. The Panthers had four first-team selections, two second-team selections, Defensive Player of the Year (Kyle Clinton), Freshman of the Year (Logan Luque) and Coach of the Year (Surrency).